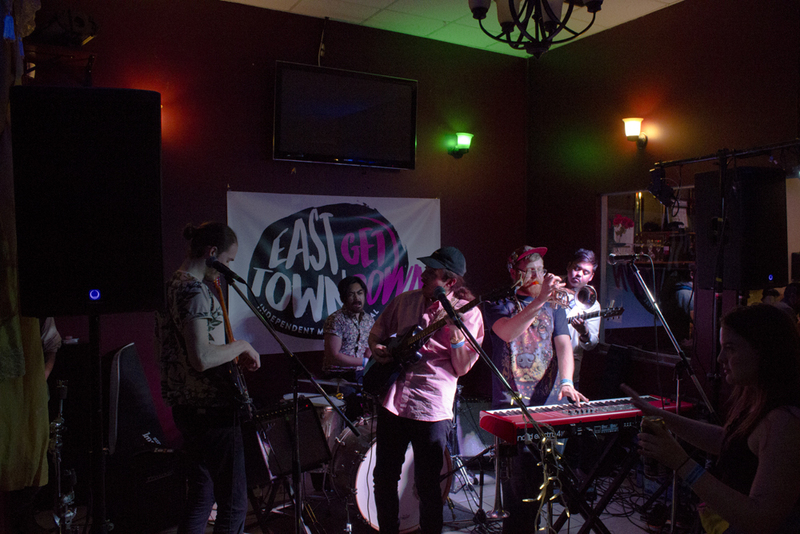 The East Town Get Down festival, raised from the ground-up by Major Minor Music Project, invited a blend of music, culture, food, and community through the coordination of everyone involved. The many teams of organizers worked with the more than 60 bands to rock out at the eight local restaurants, each sharing their space as a venue for these bands, all while the dozens and dozens of volunteers came together to pull off one of the biggest music festival to happen in 17th Avenue, SE. 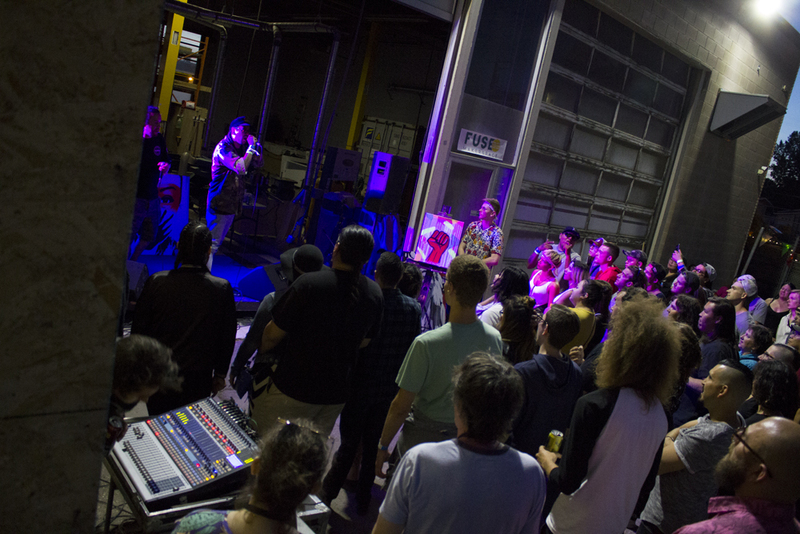 We at Calgary Show Services had the utmost honour of providing audiovisual gear and live technical production services — either in some small way, or in an extraordinary way — for every venue the sold-out East Town Get Down independent music festival on Saturday. The event’s promoter — Graham Mackenzie, the founder of Major Minor Music Project — busted his chops to ensure this festival went off without a hitch. 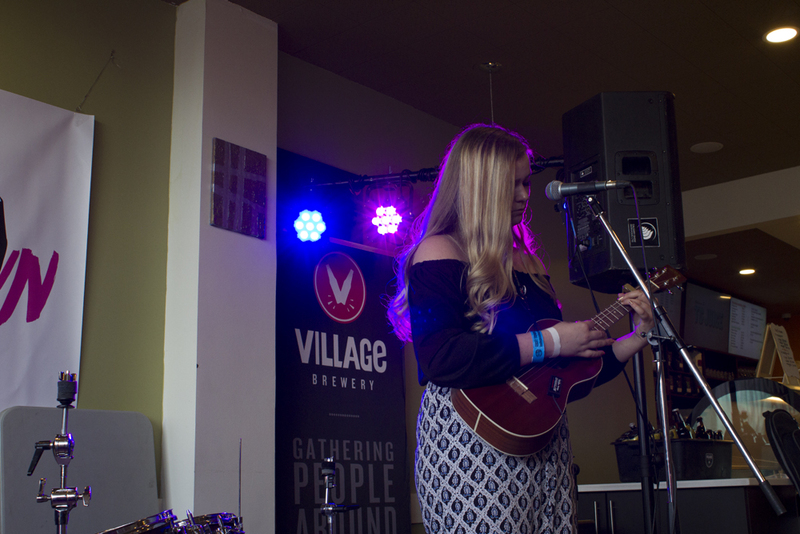 Notably, he wanted to get the scene out to the East Village, particularly to promote the beautifully rich and diverse culture that contributes to the whole of the Calgary scene, as supported and funded through the Business Revitalization Zone. While it’d be impossible to write about every band or group that hit the scene rocked out to an absolutely stellar performance, and all of the restaurants and venue owners were more remarkably pleasant to work with — especially for a sold-out festival, all while the several venues were consistently packed to capacity. 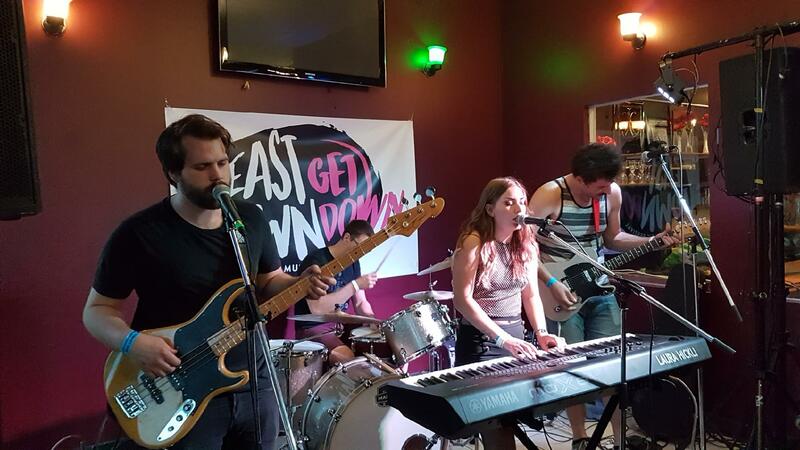 Critically-acclaimed Calgary bands such as Miesha & the Spanks and The Dudes rocked out at the Border Crossing restaurant — the go-to, classic neighbourhood pub for hospitality along 17th Ave SE. 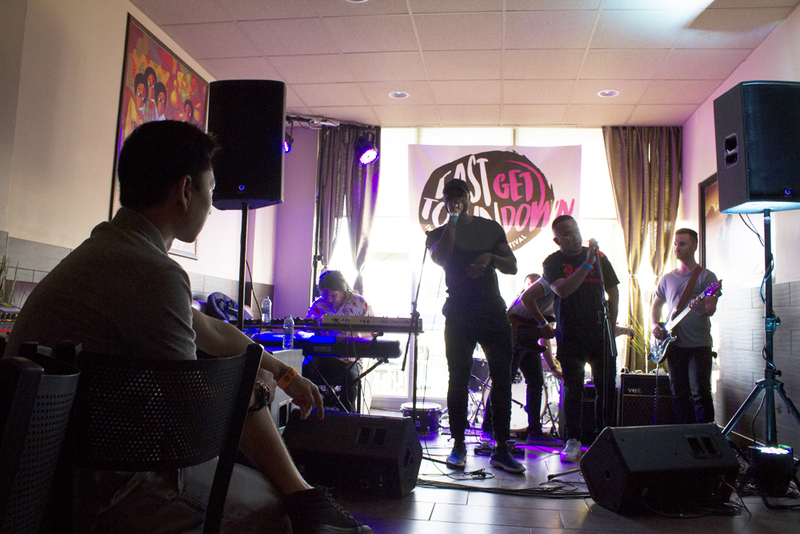 Festival-goers and Border Crossing regulars alike were blown away by the intensity of the performances, while the pub’s own sound technician, Emre, mastered the performances. 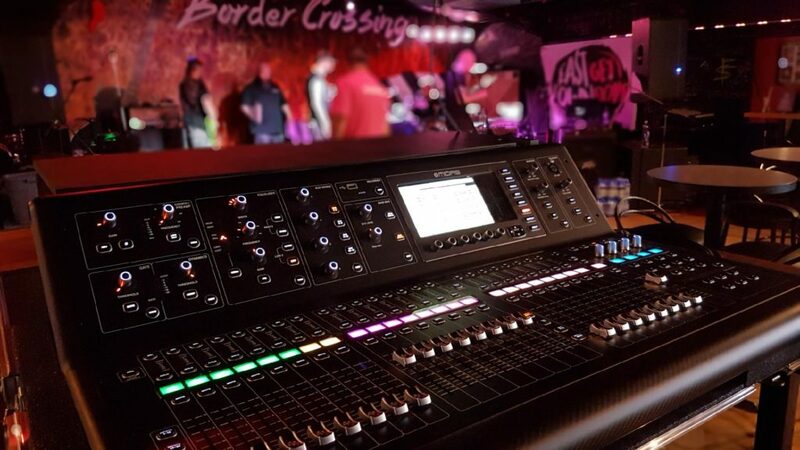 The sound technician for heavy metal group, Divinity, requested a digital mixing console, so we provided them our Midas so the band could get their sound exactly precise to their own needs. The chill mood and relaxing vibe of Ethiopian restaurant, Ensira, was a perfect environment for the jazzy funk, spiritual soul, and enlivening voices filling the room — as artists and groups like veteran Calgary funk group Dragon Fli Empire gave life to words through their remarkable sound. Mayowa, born and raised in Nigera, brought a heart-full combination of R&B, Afro roots music, and hip-hop to the dance floor — simultaneously celebrating other local artists on-stage by literally bringing in members from other groups to perform with them. Mike, of Calgary Show Services, ensured both of the keyboards used by Mayowa could be heard by mixing them both through the DI box and helping smooth out the band’s groove. As Fassil’s manager has experience as a DJ, and the venue has their own mixing board, we at Calgary Show Services were able to get a little extra creative with the sound. They brought their own passive speaker outside, while we plugged into their mixing board, so the bands could be heard from the restaurant’s own speaker outside — an excellent touch to keep the show rocking outside of the venue. The mix of brilliantly colours in the Ethiopian meals from the Fassil Restaurant represented a rich metaphor for the cultural mosaic alive throughout the scene at the Festival. Closing the evening at Fassil were the beloved veterans of the Calgary independent music scene, I am the Mountain, who rocked their hearts out past the sun down, keepin the toes tappin’ and the hips wigglin’. Coincidentally, the audiovisual tech for the Fassil Restaurant — Eric (left), of Calgary Show Services — rocked out with Time Boy (above), while Kris mixed sound for him. 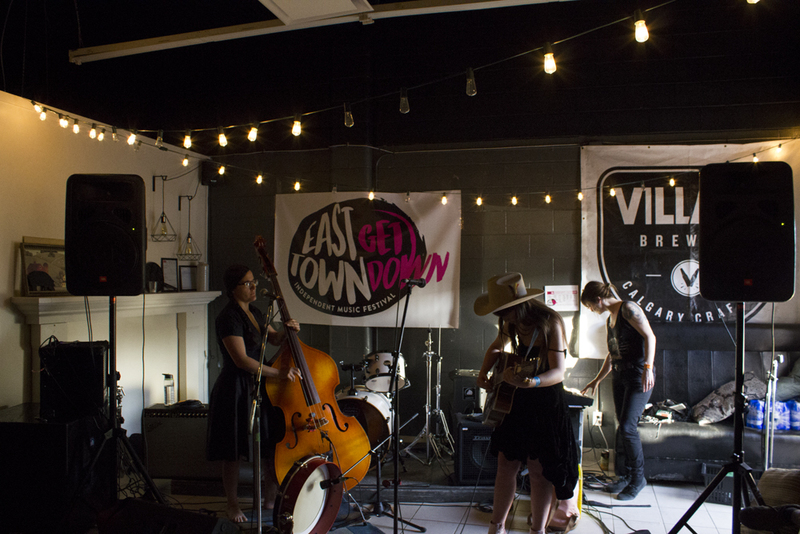 This small moment, among many, speaks to the rich reciprocity coming alive in the Calgary music scene through the East Town Get Down. 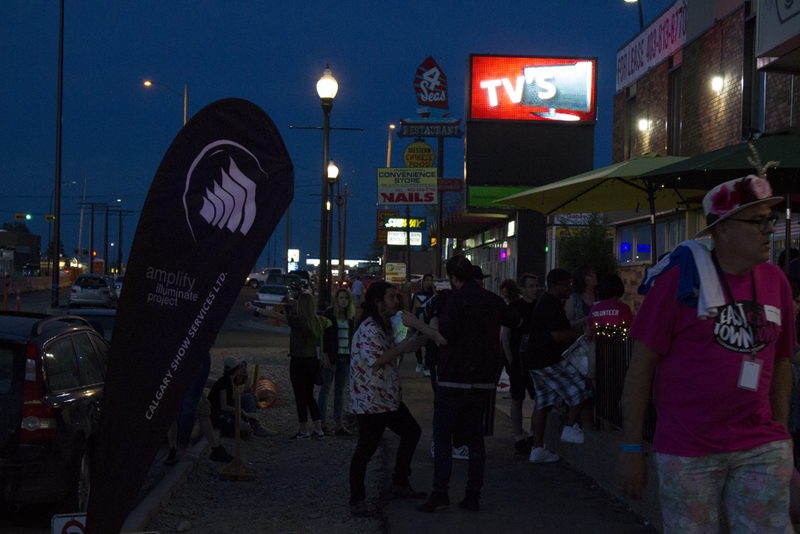 Known as “Calgary’s Community Shop,” Fuse33 Makerspace is probably the most unique venue of the festival. Fuse33 is generally a place where people are more likely to be building a stage than performing on one — which is what made this space-turned-venue so fun. Respectfully, the first group to perform here, Eya-Hey Nakoda, opened with a prayer song — setting the stage for the other performers that evening. Notably, Snotty Nose Rez Kids (above) closed the set the evening with intellectual Indigenous hip-hop that kept the people bouncing, while Rhys (left), of Calgary Show Services, kept the sound mix alive the whole evening. The delicious smoke and oak aroma of Jane Bond BBQ wafted and lingered in the air, as Calgary’s own critically-acclaimed folk artists strummed their soul out under the pixie lights. Artists like Rae Spoon and Samantha Savage Smith soothed the soul with their own idiosyncratic twang, carrying their country sounds through the air, and complimenting the senses perfectly alongside the restaurant’s distinct savoury country cooking. Jess Panther — the dedicated sound tech (right) — ensured artists like Amy Nelson (pictured) could get comfortable in that groove, and giving the audience a similar feeling to an intimate house show. Another amazing place-turned-venue is the Paradise Lanes Bowling Alley, featuring rock and metal groups all evening — while the pins knocked and punks rocked. The first performances were brought on through School of Rock Calgary House Band, as they showcased those young and incredibly talented rock performers between the ages of 12-16. The evening stayed at maximum intensity until the closing band, Dead Pixel, strummed their last note. 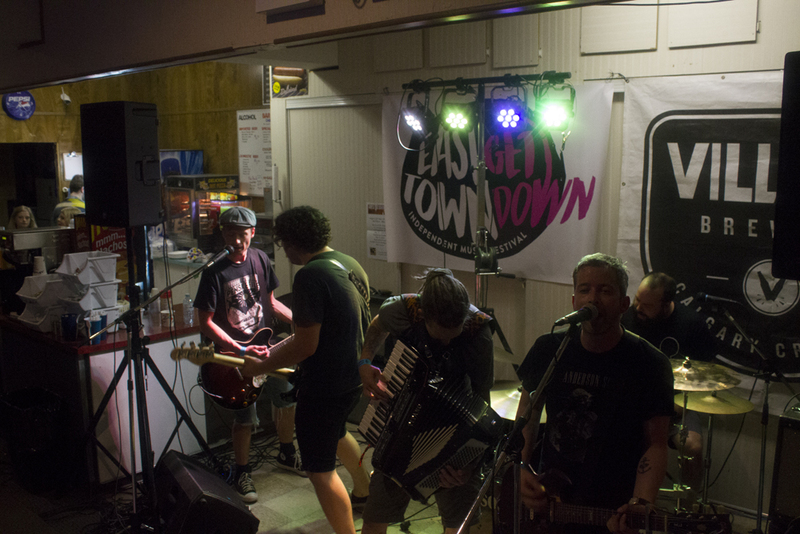 We provided lights for the venue, setting them to respond to the pulse of the music through their own sensitivities, so those in the mosh could be part of the rock-and-roll chemistry of bands like River Jacks. As the event lasted all day, three sound technicians — including a dedicated member of Calgary Show Services — rotated out to provide the best sound we could throughout the evening. While providing authentic Mexican cuisine, Salsas restaurant also provided a space for a dynamic range of performers to share — so independent artists, from the heartfelt acoustic music from Kate Stevens (pictured below) to the hard rock of Siksika’s prairie-punk Iron Tusk, could share the stage. We at Calgary Show Services set up the speakers and sound system for the volunteer sound tech. Mmmm… We can still taste those tacos! The TG Juice Bar opened up a space for sound as fresh as their own exhilarating drinks. As this delicious and nutritious juice joint revitalized their clients in the small little place-turned-venue, artists like Chief N Council and Ride the Sky transcended the stage between space and time. 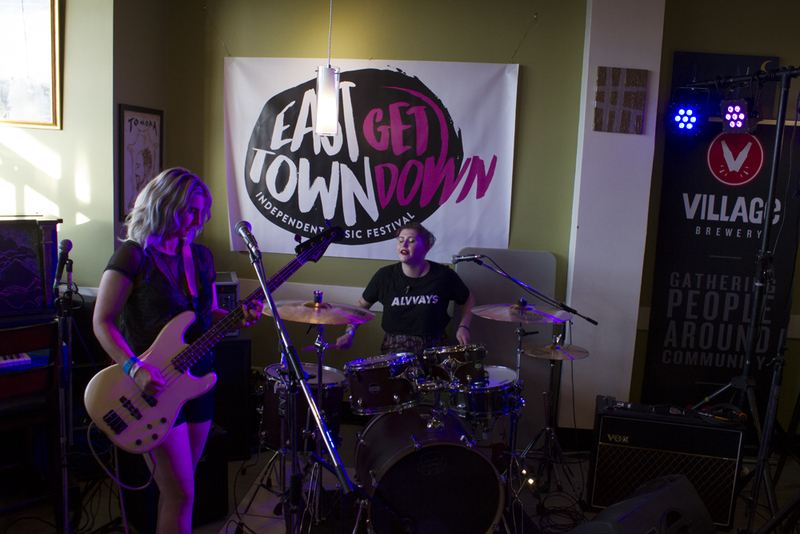 Calgary duo, Mademoiselle, kept the audience enthralled throughout their entire performance, filling the groove perfectly between bass, drums, and dual vocals. Overall, we at Calgary Show Services were proud to bring our A-game to the table, by providing speaker systems, set-up, and skilled technicians and on-hand AV assistance to each venue as required. Naturally, festival-goers each felt that immensely transforming community energy, and they experienced those deeply personal moments all throughout the evening.